Mr. Robert W. Thue, age 92, passed away Monday, January 28, 2019. He was born in Muskegon, MI, on June 4, 1926 to Raymond & Julia (Rozyski) Thue and served his country in the US Navy during World War II. He married the former Mary Kesteloot on November 23, 1946 and together they fostered 53 children. 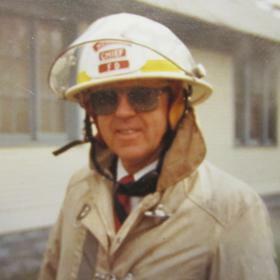 Mr. Thue was the Fire Chief of Muskegon for 35 years until retiring in 1985 and was known affectionately as “By the book Bob”. 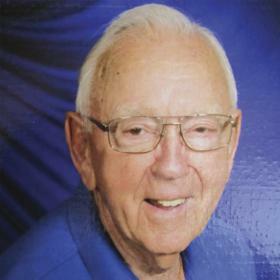 Robert was a life member of St. Michael's Catholic Church. He loved the water and sailing and was a past racquetball champion at the YMCA. Daughters, Marjorie (Dwayne) Brawley of AR, Suzanne (Ron) Hosler of Muskegon; grandchildren, Justin (Kara) Brawley, Melissa (Matt) Toomey, Eric Hosler, Renee Hosler; great grandchildren, Hayden, Hadley, Isiah, Isabella, Tianna; sister, Sister Mary Ann Thue; brother-in-law, Bill (Carol) Kesteloot; sister-in-law, Virginia (Louis) Shields; special friends, Rosemary Klemp & Marty Klemp. He was preceded in death by his wife, Mary in 2012; sister, Betty and brother, Raymond. Saturday, February 2, 2019, 1:00 PM at St. Michael's Catholic Church with Fr. Charles Hall officiating and Military Rights under the auspices of the Muskegon County Council. Friday, February 1, 2019, 5:00 PM to 7:00 PM with a Rosary Service at 6:30 PM at Clock Funeral Home - Muskegon. MEMORIAL: St. Michael’s Catholic Church.